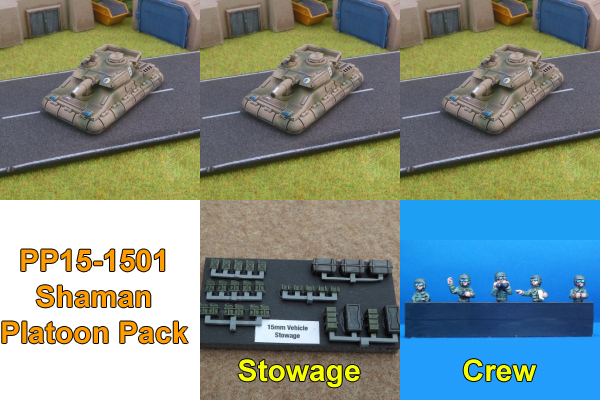 We’re launching a series of Platoon Packs for our 15mm range. Platoon packs are a great way to build up your forces quickly and save money into the bargain. They contain three tanks, along with a pack of vehicle stowage and a half-pack (five figures) of vehicle crew – and all of this for less than the cost of the three tanks bought individually. Initially we’ve set up packs for ten types of tank. If these are successful then we’ll add other vehicle types, such as APCs. This entry was posted on Thursday, August 28th, 2014 at 23:06 and is filed under News. You can follow any responses to this entry through the RSS 2.0 feed. You can leave a response, or trackback from your own site.